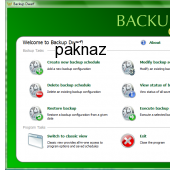 Backup Dwarf is an extremely easy to use backup software that performs automatic backups of your important files, projects, music, mp3, videos, photos and documents. It is intended for home users who want to prevent data loss and for business users who want to assure their files are archived on a regular basis even when using laptop. You can schedule daily, weekly (on selected week days) or monthly (on selected month days) backups with advanced filter options, inclusive and exclusive. Backups can be full or incremental and they are stored in ZIP archives so they can be read by any Windows operating system even if the original data and system are corrupted. This backup software supports storing backup files to separate folder on same or different hard disk, to an external pendrive, to a shared network folder, to Network Attached storage device or to FTP server. Compression level is adjustable from no compression at all (to speed up the process) to maximum compression (for efficient storage usage). Compression also works for FTP backups. Extremely easy to use with user friendly user interface. There are two views available: Classic view which shows all options in tabbed windows and Wizard mode which guides you step by step during backup schedule creation. All backup operations are performed completely hidden from user so they will never disturb your work. There is no system tray icon to bother you. You decide if you want to check the status of operations by launching the application. Detailed log information is provided so you exactly know if there were any errors during backups. 60 days trial allows you to make sure this is the software you need. Price starts from $19 and includes excellent support service and free upgrades for life.